Prospects looked bleak for seeing the January 31 total eclipse of the Moon. A little planning, a chase, and a lot of luck made it possible. A mid-winter eclipse doesn’t bode well. Especially one in the cold dawn hours. Skies could be cloudy. Or, if they are clear, temperatures could be -25° C.
I managed to pull this one off, not just seeing the eclipse of the Moon, but getting a few photos. Because this eclipse was occurring before dawn for western North America the eclipsed Moon was going to be in the west, setting. 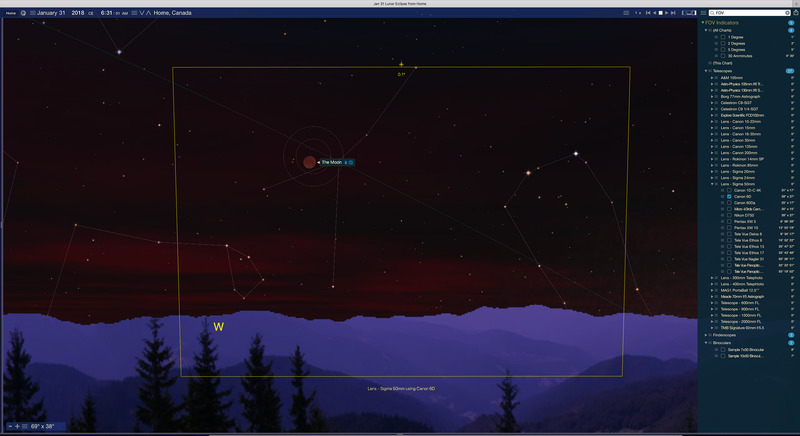 To plan any shoot the first app I turn to is the desktop planetarium program Starry Night™. 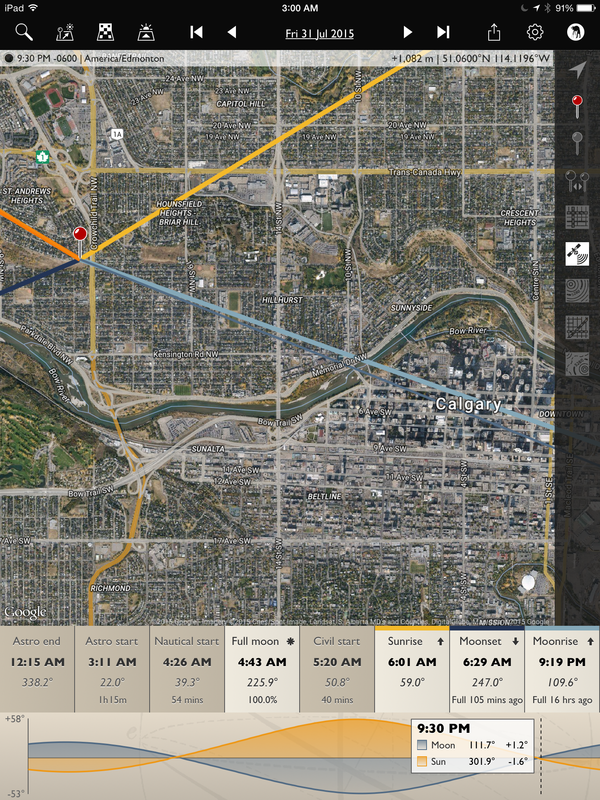 Shown above, the program simulates the eclipse with the correct timing, accurate appearance, and location in the sky at your site. You can set up indicators for the fields of various lenses, to help you pick a lens. The yellow box shows the field of view of a 50mm lens on my full-frame camera, essential information for framing the scene. With that information in mind, the plan was to shoot the Moon over the Rocky Mountains, which lie along the western border of Alberta. The original plan was a site in Banff on the Bow Valley Parkway looking west toward the peaks of the Divide. But then the next critical information was the weather. For that I turned to the website ClearDarkSky.com. It uses information from Environment Canada’s Astronomy forecasts and weather maps to predict the likelihood of clouds at your site. The day before the eclipse this is what it showed. Not good! Home on the prairies was not an option. While Banff looked OK, the best prospects were from farther south in the Crowsnest Pass area of Alberta, as marked. So a chase was in order, involving a half-day drive south. But what actual site was going to be useful? Where could I set up for the shot I wanted? 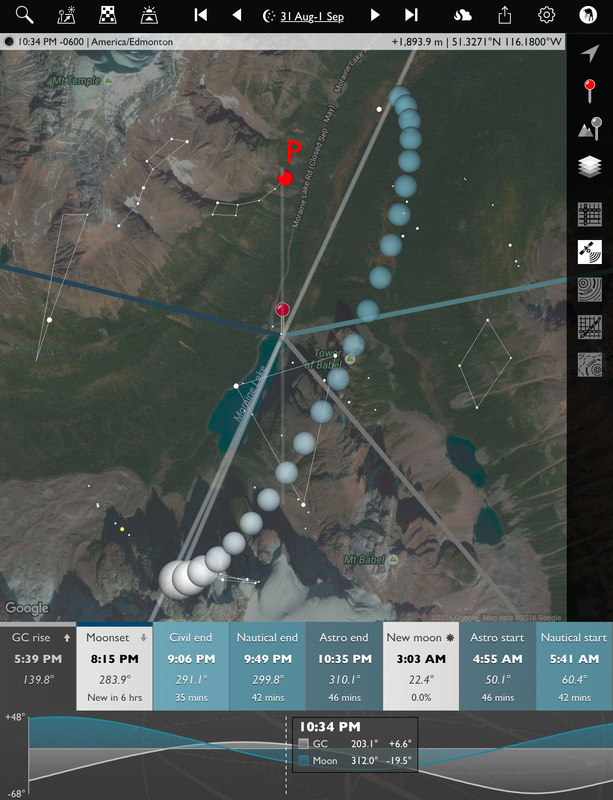 Time to break out another app, The Photographer’s Ephemeris. This is for desktop and mobile devices. I needed a spot off a main highway but drivable to, and with no trees in the way. I did not know the area, but Allison Road looked like a possibility. 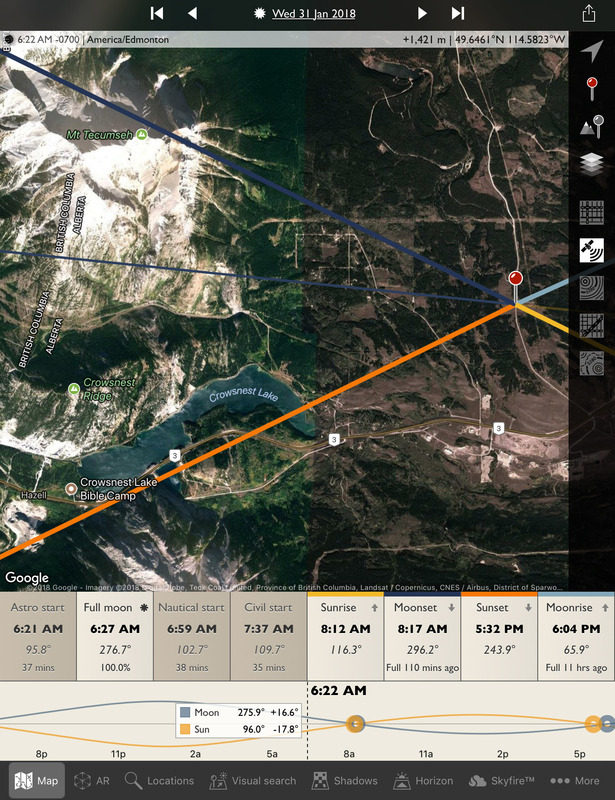 The TPE app shows the direction to the Sun and Moon to help plan images by day. And in its night mode it can show where the Milky Way is. Here, the thin blue line is showing the direction to the Moon during totality, showing it to the south of Mt. Tecumseh. I wanted the Moon over the mountains, but not behind a mountain! With a possible site picked out, it was time to take a virtual drive with Google Earth. The background map TPE uses is from Google Earth. But the actual Google Earth app also offers the option of a Street View for many locations. Above is its view from along Allison Road, on the nice summer day when the Google camera car made the drive. But at least this confirms there are no obstructions or ugly elements to spoil the scene, or trees to block the view. But there’s nothing like being there to be sure. It looks a little different in winter! After driving down to the Crowsnest Pass the morning before, the first order of the day upon arrival was to go to the site before it got dark, to see if it was usable. I used the mobile app Theodolite to take images (above) that superimpose the altitude and azimuth (direction) where the camera was aimed. It confirms the direction where the Moon will be is in open sky to the left of Tecumseh peak. And the on-site inspection shows I can park there! It provides elevation maps and places you on site, with the actual skyline around you drawn in. And with the Moon and stars in the sky at their correct positions. While it doesn’t simulate the actual eclipse, it sure shows an accurate sky … and what you’ll frame with your lens with the actual skyline in place. This is a blend of a 15-second exposure for the sky and foreground, and a shorter 1-second exposure for the Moon to prevent its disk from being overexposed, despite it being dim and deep red in totality. Both were at f/2.8 with the 50mm Sigma lens on the Canon 6D MkII at ISO 1600. Zooming out with TPE 3D provides this preview of a panorama I hoped to take. It shows Cassiopeia (the W of stars at right) over the iconic Crowsnest Mountain, and the stars of Gemini setting to the right of Tecumseh. Here’s the real thing, in an even wider 180° view sweeping from south to north. Again, just as predicted! 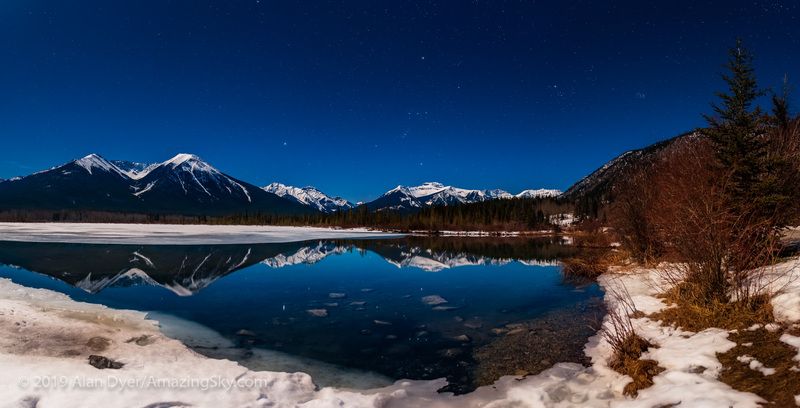 The panorama is from 8 segments, each with the 35mm lens at f/2.8 for 15 seconds at ISO 1600 with the Canon 6D MkII. Stitching was with Adobe Camera Raw. The Moon itself is blend of 4 exposures: 15 seconds, 4 seconds, 1 second, and 1/4 second to retain the red disk of the eclipsed Moon while bringing out the stars in the twilight sky. 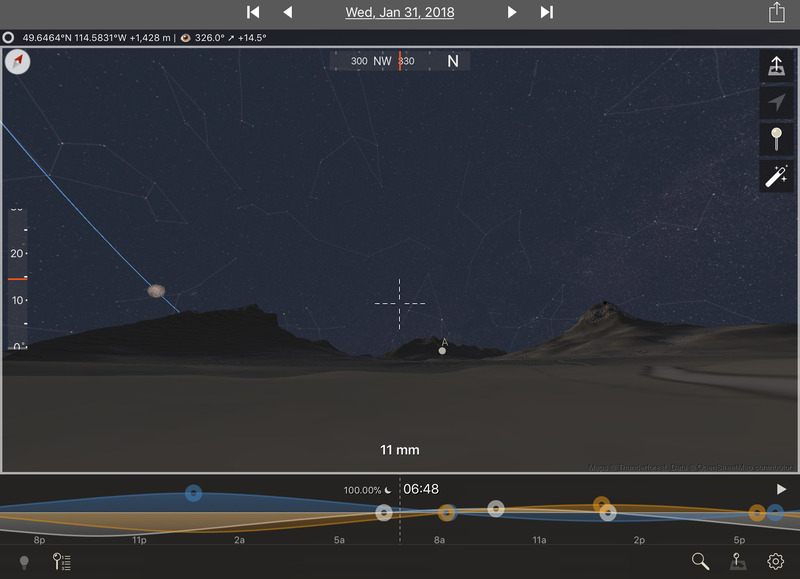 Between the weather predictions – which proved spot on – and the geographical and astronomical planning apps – which were deadly accurate – we now have incredible tools to make it easier to plan the shot. If only we could control the clouds! As it was, the Moon was in and out of clouds throughout the 70 minutes of totality. But I was happy to just get a look, let alone a photo. The next total lunar eclipse is in six months, on July 27, 2018, but in an event visible only from the eastern hemisphere. The next TLE for North America is a more convenient evening event on January 20, 2019. That will be another winter eclipse requiring careful planning! 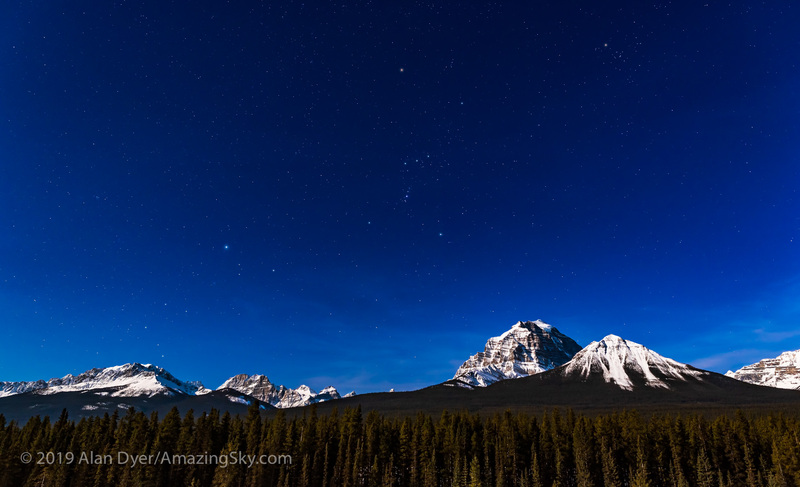 On a very clear night, Orion shines over the skyline of Calgary. 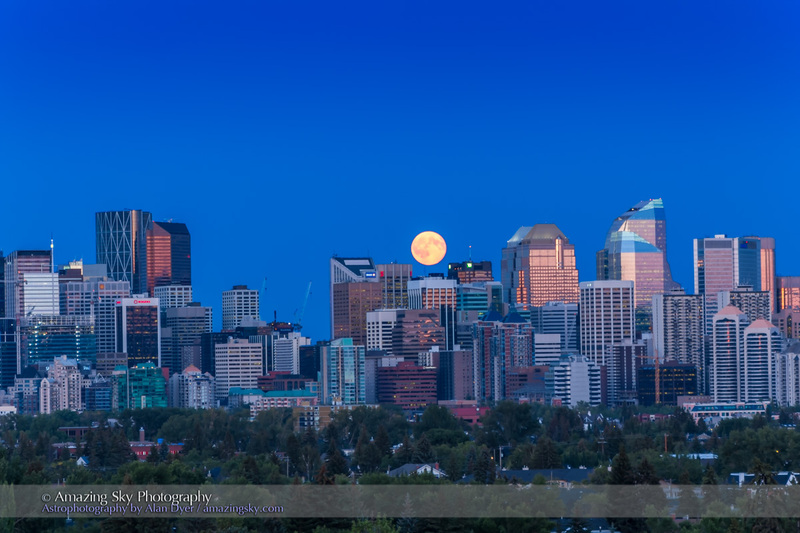 As I live in the country, it’s not often I shoot the stars from urban sites, and certainly not from downtown Calgary. But the combination of a clear night and a speaking commitment in Calgary provided a chance to see what was possible under ideal conditions. The lead image is real – I did not paste an image of the sky taken at some other time or place over the skyline image. However, the sky image is a longer exposure (10 seconds) than the ground (3 seconds) in order to bring out the stars better, while keeping the city lights under control with no overexposure. So it is sort of a high dynamic range blend. The other factor that helped reveal stars as faint as shown here (fainter than what the naked eye can see) is the use of a light pollution reduction filter (a NISI Natural Night filter) to penetrate the yellow sky glow and provide a more pleasing colour to the sky. Earlier in the night, during twilight when urban light pollution is not so much of an issue, I shot the waxing crescent Moon setting over the skyline. This is a panorama image made from high dynamic range blends of various exposures, to again accommodate the large range in brightness in the scene. But I did not use the NISI filter here. These images demonstrate how you can get fine astronomy images even from urban sites, with planning and timing. 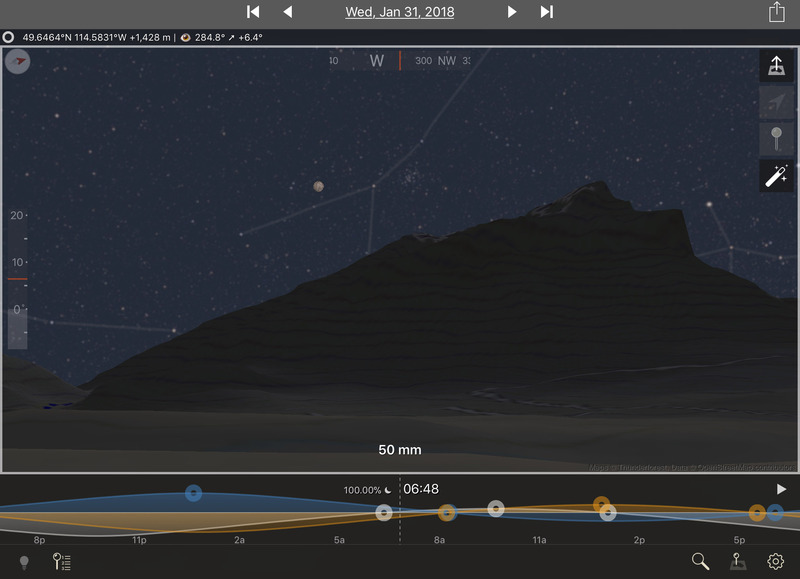 To that end, I used my favourite app, The Photographer’s Ephemeris, to determine where the sky elements would be as seen from a couple of viewpoints over the city that I’ve used in the past. The blue spheres in the left image of TPE in its Night mode represent the Milky Way. That chart also shows the direction toward Orion over the city core. The right image of TPE in its Day mode shows the position of the Moon at 6 pm that evening, again showing it to the left of the urban core. Other apps are capable of providing the same information, but I like TPE for its ease of use. What a night this was – perfect skies over an iconic location in the Rockies. And an aurora to top it off! On August 31 I took advantage of a rare clear night in the forecast and headed to Banff and Moraine Lake for a night of shooting. 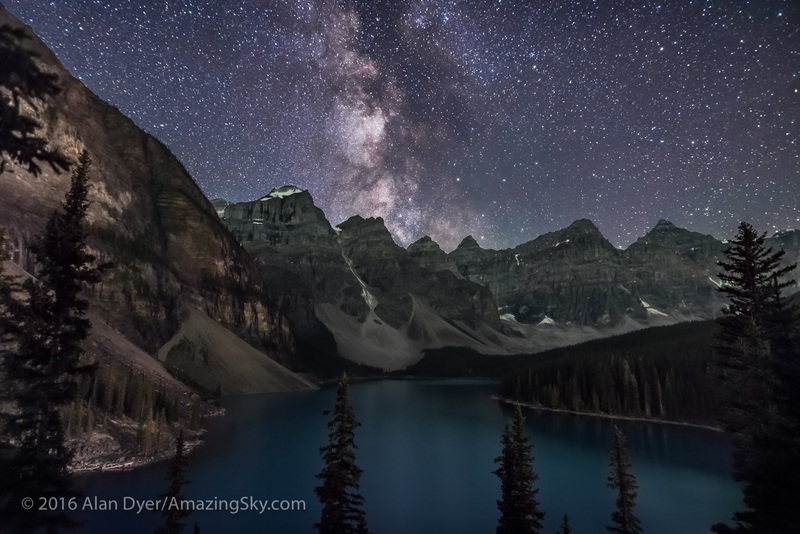 The goal was to shoot a time-lapse and stills of the Milky Way over the lake. The handy planning app, The Photographer’s Ephemeris, showed me (as below) that the Milky Way and galactic centre (the large circles) would be ideally placed over the end of the lake as astronomical twilight ended at 10:30 p.m. I began the shoot at 10 p.m. as the sky still had some twilight blue in it. I planned to shoot 600 frames for a time-lapse. From those I would extract select frames to create a still image. The result is below. 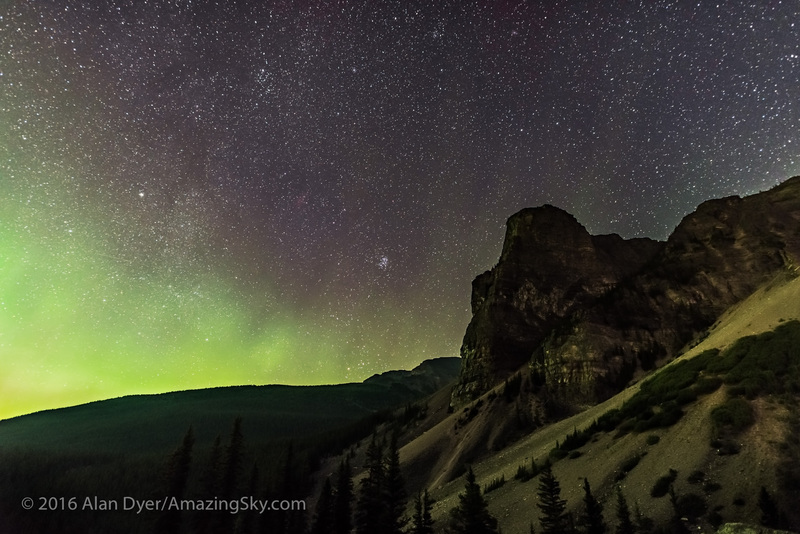 This is looking southwest with the images taken about 11:15 pm on August 31, 2016.The ground is illuminated by a mix of starlight, lights from the Moraine Lake Lodge, and from a display of aurora brightening behind the camera to the north. 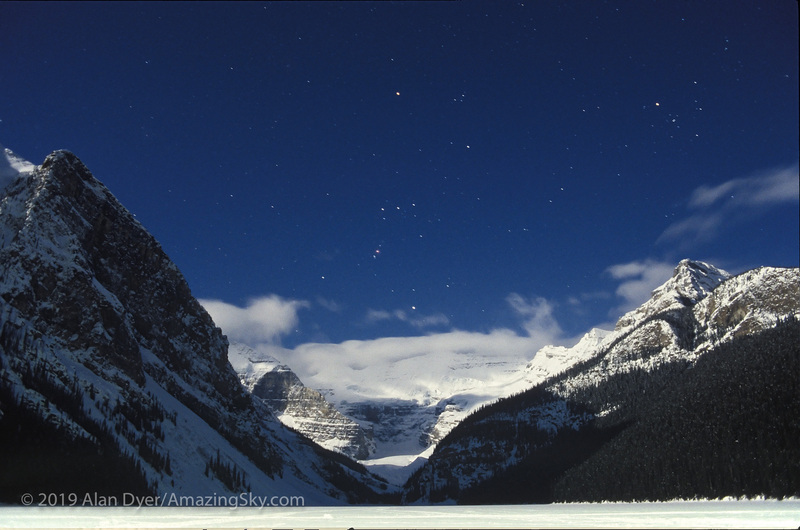 The starclouds of Scutum and Sagittarius are just above the peaks of the Valley of Ten Peaks. This is a stack of 16 images for the ground, mean combined to smooth noise, and one exposure for the sky, untracked, all 15 seconds at f/2 with the Sigma 20mm Art lens and Nikon D750 at ISO 6400. The frames are part of a 450-frame time-lapse. 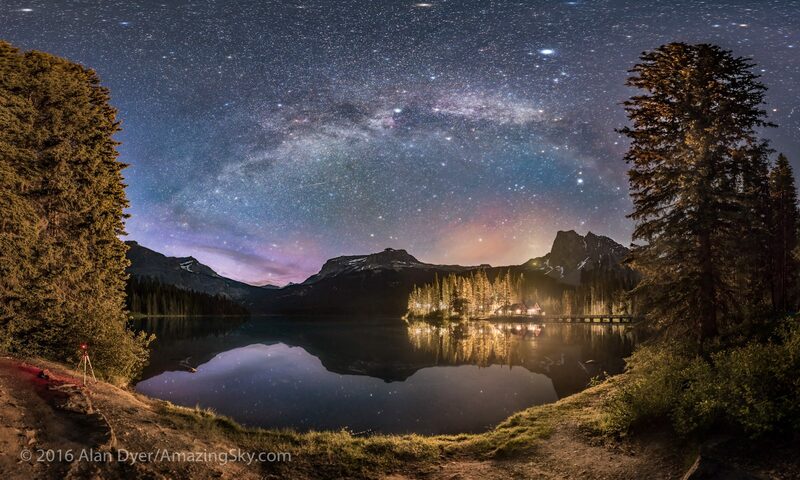 The lead-image panorama is the first result, showing the sweeping arc of Northern Lights over Desolation Valley. The Northern Lights in a fine Level 4 to 5 display over Desolation Valley at Moraine Lake, Banff National Park, on the night of August 31/Sept 1. This is one frame from a 450-frame time-lapse with the aurora at its best. This is a 2-second exposure at f/2 with the Sigma 20mm Art lens and Nikon D750 at ISO 5000. Still images shot, I began a time-lapse of the Lights, grabbing another 450 frames, this time using just 2-second exposures at f/1.6 for a rapid cadence time-lapse to help freeze the motion of the curtains. I ended the night with a parting shot of the Pleiades and the winter stars rising behind the Tower of Babel formation. I last photographed that scene with those same stars in the 1980s using 6×7 film. The early winter stars rising behind the Tower of Babel formation at Moraine Lake, Banff National Park, with a bright aurora to the north at left. Visible are the Pleiades at centre, and Capella and the stars of Auriga at left. 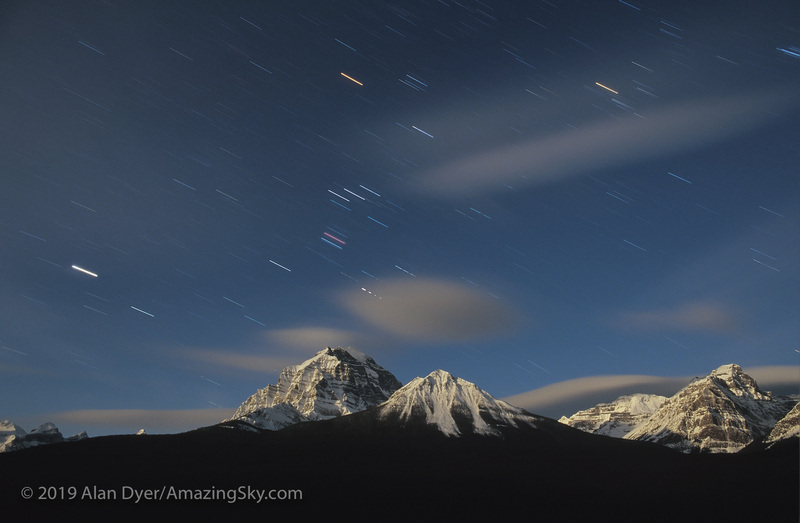 Just above the mountain are the Hyades and Taurus rising. At top are the stars of Perseus. Aries is just above the peak of Babel. The aurora in part lights the landscape green. This is a stack of 16 images for the ground, mean combined to smooth noise, and 1 image for the sky, untracked, all for 15 seconds at f/2.2 with the Sigma 20mm Art lens, and Nikon D750 at ISO 3200. All with LENR turned on. In a summer of clouds and storms, this was a night to make up for it.